If you go to some local comics shops, you’ll often find what many of us refer to as “the quarter box,” meaning the books therein often sell only for 25 cents. However, not all comics that end up there stay there. If DC or Marvel revive a character found in one of those books, like Rocket Raccoon for instance, then those books might make a huge leap to the collectibles, and fast! Companies like Marvel take note that the local stores can make money that way, and for a long time, they were content to let that happen. GIT YER COMICS HERE FOR A DOLLA! 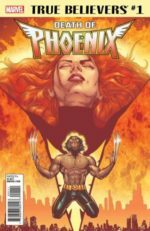 Marvel is making ten previous stories of the Phoenix available for only a dollar each to sell in conjunction with their current storyline dealing with Jean Grey. It wasn’t all that long ago that I’d find these stories up on the wall with big price tags on them. (In fact, some places still do that.) But with new, re-colored versions on the stands for just a buck, that practice is fading away. After all, you have to keep every comic produced by Marvel or other companies to be ready should such a revival occur. Most stores don’t have nearly that kind of storage space. Now, of course Marvel would love it if you do keep multiple copies of their previous issues around just in case such a thing happens. It’s called show business, after all! However, these days of limited budgets and restricted shelf space don’t really work well with that business plan. And, truth be told, Marvel wants to take in as much of the profits from comics as possible today, even though they dearly love the local shop owners and their businesses! It’s a matter of survival. Besides the profit angle, why else would Marvel want to reprint classic stories? For one thing, not all of us buying books today have read all these tales. 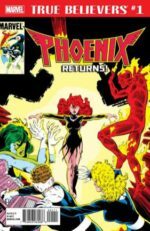 I haven’t read every Phoenix story in this group, for example, and I’ve been buying comics for decades! What this practice does is help newer readers better understand the nuances of upcoming storylines. I have often joked that if I had a million dollars, I still couldn’t afford to buy all the previous X-Men titles. I also don’t have the time to read them all so I can figure out what happened to Colossus in issue such-and-such and why that’s important to the latest issue. If I’m a collector, though, that’s a big concern! I’ve worked hard to get and store all those comics for just such an occasion! 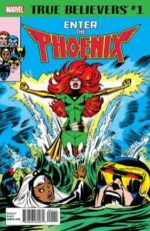 The sad thing is that people who buy each and every X-Men released these days are a much smaller group than they used to be. People who can afford ten $1.00 comics, however, are a potentially bigger number. It wasn’t that long ago that both Marvel and DC provided collections of previous comics that were published on newsprint and only black-and-white to make them more affordable. The cool thing about these books was that you got to read many of the issues in the original sequence. I’ve bought a few of them in my day, and it was great to re-explore the books as they were originally available. Granted, there are many storytellers who utilize black and white to its fullest potential, and I love to see that happen. But today’s younger readers, I was told during a printing seminar, expect color. They avoid black and white like the plague! And I work at a paper that prints many of its pages in black and white, but the owner believes the audience skews much older, so she doesn’t care. Oh, well! It’s something of a gamble to print dollar comics these days. In fact, I hear rumblings every once in a while that Marvel’s about to increase their general cover prices from $3.99 to $4.99. I think fan reaction has been mostly negative to that, but I feel it’s inevitable. If you want Marvel, you’ll pay more to get it is the rationale I keep hearing those in support of this policy. I wonder if the creators of the dollar comics will see any new money from the reprints. I doubt it, but it would be nice. Of course, costs are kept low by reprinting existing stories and only recoloring them, but I’m sure they still lose money on every individual issue they print. They hope to make up for that with higher sales of the new books, I’m sure! I hope it does work because there are some classic stories I’d like to dive back into again after several years. And I hope more readers means higher sales, which can translate into more comics. And I always want that to happen!